Delivering Happiness; Proof …the “Golden Rule” is Profitable ! Does your business (do you) solve your customers’ unresolved problems? Does your team’s culture promote serving your internal and external customers to ultimately deliver happiness in their lives? Or, are you like the 90% of businesses out their hunkered down, focused on your numbers…driving costs out of your business…achieving your objectives…striving to hit your bottom line? Businesses who passionately deliver happiness through solving their customers’ unresolved problems grow rapidly and are significantly more profitable than those with an inward focus. Market leaders passionately serve their market’s needs and experience greater shareholder value than those inwardly focused. If you read my blog, you know I enjoy reading. Some time ago one of my mentors said “leaders are readers” and this gave me a ravenous appetite to read and learn. 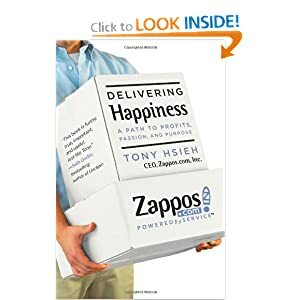 I just finished: Delivering Happiness ;A Path to Profits, Passion, and Purpose by Tony Hsieh the founder of Zappos. The book is a quick read as it is written in a conversational tone that makes its overall message and stories connect. What I enjoyed most is you cannot argue with Zappos success having just recently been acquired by Amazon for $ 1 billion. The first two examples, the concerned CFO and the Driven leader can be convinced, however the business leader who is out for his own personal goals …well he or she will take a great deal of convincing and may never see the light based on my experience. The sad reality is this last type often looses what they are working so hard to create since they are focused on the wrong self-serving outcome. Will we have enough cash? Will that promised big order come in? I now know what we need to do but can we truly afford to do it? Will that big receivable we have been waiting on arrive in time for us to make payroll? Should I continue to personally invest in this business or cut bait? Can we find the funding we need in time? I particularly enjoyed Tony’s account of the roadblocks and the corresponding emotions we all face in launching anything new. In the past 26 years of launching new products, new businesses, I cannot recall one that we did not encounter unforeseen roadblocks. What we must quickly do is identify the issue with unfiltered data, focus on the solution, the objective we plan to achieve, and take action. Businesses that face roadblocks like the proverbial deer in the headlights get run over. What stands out most is how Zappos is a current example of a business that intentionally has woven the golden rule through their culture and their brand. Far too many organizations launch with an unintentional disconnect between what they say in their mission and value statements and what they actually do. This disconnect is felt internally as well as in their market and in both cases violates trust. Establishing trust is the most critical foundation in building win-win relationships with your internal and external customers. So how about your company…. Do you have core values? Can everyone on your team rattle them off…or just HR? Are your core values intentionally woven into how you serve your market…or are there exceptions to the rule? Have you intentionally set out to build trust with your internal and external customers? Does your team authentically live the core values of your organization in all they do…or are their very actions breaking trust with your internal and external customers? Do your team members have the freedom (and sense of safety) to boldly challenge practices not in align with your core values?….even if one of your senior leaders is violating them? Is your business, (you), your team, delivering happiness to your internal and external customers? What is the cost to your bottom line if one of your competitors intentionally sets out to serve their market when you continue your inward focus on your goals and your bottom line?